In the Business Case Study series Part 5, James Schramko and Matthew Paulson tackle the topic of business name change. The right name can spell the success of a company. If your name isn’t ideal to begin with, how do you find a better one and make the switch? Discover how in this episode. 04:28 – Where have all the good names gone? James: James Schramko here, welcome back to SuperFastBusiness.com. You’re listening to Part 5 of a 6-part series that I’m doing with my good friend, Matthew Paulson. Good day, Matthew. James: Good. We’re going well so far. Now if you haven’t listened to the first few episodes of this series, I recommend you go back and listen to them. They’ll all be linked to in the show notes. Part 1 was how to grow and monetize an email list of 250,000 emails. Part 2 was about side projects, and why you probably shouldn’t do them. That episode had a really big reaction in the Internet marketing community, which we’re very grateful for. And Part 3 was a website sale case study, where you sold a website for $400,000, Matthew, and we broke that down. Part 4 was all about optimizing your business, and how to double revenue if your business is failing, or even if it’s not, in 6 months or less. Today we’re talking about how to successfully change the name of your business. So, Matthew, why would we want to do this? Matthew: Well, when you first start out your business, you’ll pick out a name and sometimes that’s not a good name, and it takes you a while to figure that out. The name of my business was Analyst Ratings Network, and it doesn’t take long to figure out why that’s not a good name. You know, there’s 3 words to it, it’s hard to pronounce for some people, it’s 7 syllables long. It just wasn’t a good name, and I didn’t realize that because I wasn’t communicating it with people verbally, it was just through the Internet, so in email you can get it, but the repeatability of that name was not good. What kind of came to a head and made me decide to change the name, I went to a conference called MicroConf, and I was talking to people about the name, about my business, what it does, and whenever they would repeat the name back to me, they would get it wrong. I would hear, “Analyst Network,” “Analyst Ratings,” but I would never hear the full name, and it just happened over and over and over again, and I thought, hey, this is a problem. If other entrepreneurs can’t get the name right, I doubt my customers will too. And that kind of sealed the deal and I figured, I need a better name for this business. James: Right. You know, it’s a pretty common thing where we have a suboptimal name. I’ve had a few names, similar thing. I had a website development company and it was called ATLWeb, and a lot of people were calling it “ALTWeb”. So it was probably because ALT is some kind of a keyboard maneuver. And ATLWeb originally was sort of a short code for Atlanta. But people outside the U.S.A. don’t know what short codes for states are. People inside the U.S.A. still preferred ALT than ATL. In the end, I decided to move that back the the mother ship and change it. But I’ve had much better success with other names that are so much more obvious. SuperFastBusiness is much easier for people to remember compared to ATLWeb. And I’ve done a lot of brand mushing up, where we‘ve rolled up several brands. At one stage, we had InternetMarketingSpeed for our blog, we had FastWebFormula for the community, ATLWeb for websites, SEOPartner for SEO, BuyWithBonus for affiliate stuff. We had some domains for sale on a website where we were just selling domains. In the end we just scooped them all up and brought them back to one place. And it was so much easier. And that’s another thing, it might be just simpler for customers to find you and to understand what you do if you have a good name. Are the good names all taken? While we’re on this, I’ve noticed some people come up with objections like, all the good names are taken. And I just want to cover that one. We talked about this a little bit in the last episode, actually in episode number 3 when we were talking about selling a website. There’s lots of good domains for sale. Often, you can find a great domain that’s for sale. And sometimes they might cost $1,000 or $2,000 or $3,000, however, you’ve got to weigh that up in terms of the long haul for your business. How much is your business worth to you? I mean, we gave that case study where you sold a business for $400,000. A good name is going to be a very small part of the overall success of that business in terms of cost, but a big part in terms of how much you can sell it for. Matthew: Absolutely. The name that I picked, which is called MarketBeat.com, that name was actually taken. The Wall Street Journal used it for a while. They haven’t used the name in over 2 years. I checked, the name wasn’t trademarked, and the domain was for sale on Sedo.com. And I asked a trademark lawyer, hey, do you think I could use this? It wasn’t trademarked, and he thought it would be fine if I had the domain and I should be pretty safe to use it, so I ended up paying $9,500 for the domain. For some people it’s a lot of money, but in terms of a business that does pretty well and I’m going to use the name for probably the next 5 years, it’s a relatively small investment into the business, for something that you’re going to use forever. James: It’s also a barrier to entry for other people. Some of the people who have to choose crappy domains, or go with the domain they registered for $9, they’re not going to have the same market presence as a MarketBeat-style domain. I’ve got lots and lots of 2-word domains that I have fortunately bought well and sold well. And they’re so brandable, and it’s instantly recognizable about what this domain might be for, and that’s why people buy them. There was one that I really wanted to develop out into a Udemy or a Lynda-type site called LearnStream. It was such a great 2-word domain, it really lent itself well to that type of business. It’s obvious when you hear about a name like that what it could possibly be, about learning, online streaming. So a lot of factors go into coming up with a name, and we’ve started talking about a few of them. You certainly want to do your checks to make sure that it hasn’t been used for something unsavory or bad or that doesn’t say something weird when you put the words up. Like Therapist can also be TheRapist. And you might want to trademark your domain if you can, and if it hasn’t been before. Once you do it, that’s a whole other conversation. But the main point around that is think about what domain’s going to serve you well for the next 10 years. A lot of people at 3 in the morning are going to register a domain that might serve them well for one campaign, for the next week. Think a little longer term. Think about the long haul. And I know I registered SuperFastBusiness quite some time back, and it’s been a brand that has been able to stay with me for a long time and can endure, but I should have trademarked it a little earlier. We also covered that one in an earlier episode where other people can come and start using your name if you don’t trademark it, especially in different top-level domain variations. If you get a really good domain, it’s nice to own several versions of it, just to protect your brand. And branding’s super important, and if you do have something substantial, it really is worth protecting and perhaps trademarking. So let’s talk about what are the steps involved. You’re at this point where you had your first domain, which had an unfortunate start in terms of the name, what it could have spelt out. And you decided you wanted to change it because your customers couldn’t figure out what your brand is and they could never repeat it quite properly. By the way, that used to happen to me with FastWebFormula. People couldn’t quite figure that out. So you’ve decided to make it easier, what steps have you gone through? Matthew: Yeah, so the first step was to identify the name. I had a list of probably 10 names. I just asked friends, family for, hey, what do you think sounds good? And some of my best customers I talked to and asked them. After I had 5 names, I was like, hey, I’m thinking of switching my name to one of these, what do you like and why? What do you think each one of these means? So I just did some surveying to try to get some better ideas of what people thought the new brand would mean, and what does this company do? And I got some pretty good feedback about MarketBeat. There were a couple of other names I was considering that were decent names, but when I heard them or when people thought about what those names might mean, they didn’t quite make as much sense. So you got to be really careful about the name you pick and you need to get some good feedback about it. You can’t really trust yourself in picking a name, it is something where so many people are going to be interacting with your brand. You just need to get that feedback. James: Yeah. I’ll offer a slightly contrarian point of view. I’ve often found friends and family are the very worst people to ask an opinion for, because they just often cannot relate to what it is that we do. I remember going to a meeting with my dad, actually, a lunchtime meeting, and he stood up at the table, and he had to introduce his guest, which was me, and he goes, “This is my son, James, not exactly sure what he does, but evidently it works out really well for him, and it’s got something to do with the Internet.” Then we both sat back down, and I just chuckled. It is really hard to explain what we do to the outsider. So if you do get feedback, often it’s good to think about your target customer and to see what else has already been successful in the marketplace. And I also remember an episode of Seth Godin’s, where he was talking about the weirder a name is or the harder it is to for people to grasp what it means, the harder it is to get traction in the beginning, but the stronger ownership you have when it does have traction. You look at a list of words like Yahoo, Amazon, Google, Apple – they all don’t mean that much to a first-time listener, however once you know what it is, they have ownership of that brand. So I think it’s OK to have a brandable domain, if you want to put some effort into making people know what that actually means over the long haul. Don’t just buy a domain because it’s got keywords in it and you think you’re going to pick up search traffic. I think MarketBeat is a great name for what you are doing with that subscription. Matthew: Yeah. I made the mistake of buying a keyword domain when I first started. So I called it Analyst Ratings Network, I bought AnalystRatings.net, and then I ranked every everywhere for that keyword of “analyst ratings” and it turns out that wasn’t a very important keyword and I just didn’t get a lot of traffic from it. So there, I was kind of stuck with that domain name even though the reason I bought it didn’t even have much of a business impact. James: One of the reasons I went with SuperFastBusiness is I was thinking of that triangle. You know, the one where you can have cheap, good or fast, pick 2. And I didn’t want to be cheap, because I was just coming from Mercedes-Benz. I really don’t resonate with the key Hyundai philosophy of doing things. So that was out. Definitely wanted to be good and fast. So of those 2, I thought fast is good. A lot of people online are pressed for time. And business is so general that it was able to capture all of the business units in a nice little grab bag. I didn’t want to be too specific, and one of my original companies was called J-Six Solutions. Again, solutions was quite broad, enough to cater for the next 10 years’ worth of business, whether it was sales training, whether it was website development, it didn’t really matter, I could put it all under that, because I was solving problems. So don’t pin yourself too tightly into a corner. A keyword-rich domain can be a bit restrictive for the long haul. If anything, go a little more general, a little more brandable would be something. So you’ve picked out a name with your panel of experts, you’ve decided on it, you’ve approached someone to buy it, no doubt. Matthew: Yeah. I finalized the name, the domain was listed on Sedo for 10 grand, the guy wasn’t that willing to budge and I just sucked it up and ended up paying $9,500 for that domain name, which is fine. I made sure that I could trademark it, and that wasn’t a big issue. I made sure there weren’t any existing trademarks for that name in the United States where I live. Then once the name was finalized, there was a huge process to move everything over and let customers know. When I made this move, it was only 4 or 5 months ago, and I had 200,000 people that got email from me every day. So if all of a sudden one day they started getting email from somebody they don’t recognize, that could be a lot of people doing a spam report or unsubscribing. So I had to make it very clear that this is the old name, this is the new name, this is why we are changing it, so I just made a big effort to over-communicate the change while we did it, and 4 or 5 months later now I still have a big note on the top of the website saying, hey, we changed the name. We used to be this, now we’re this, this is why. So just over-communicating the change if you’re going to do that, that’s a good thing. People don’t pay as much attention to your business as you think they do, so you can’t send one email saying hey, we changed our name. It should be probably 5 emails over the course of a couple of months and notices all over your website. If you have a newsletter, a notice in there and just make it so people can’t miss the name change. James: Yeah, it’s interesting what you said, people don’t pay as much attention as what you do. I’ve found generally, when I want to change a whole website, like when we picked up 6 websites and moved them to one, we didn’t really need to communicate that much to the customers, because I don’t think they cared so much. With the magic of a 301 search engine friendly redirect, if people were clicking on links to the old site, it would transport them to the new page on the new site that had the same information. 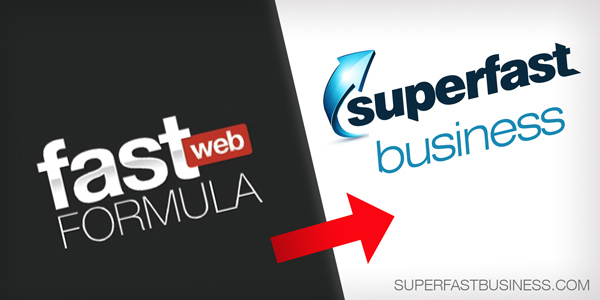 It was really interesting when I changed FastWebFormula across to SuperFastBusiness. It was a forum, so we just picked up the whole forum, copied it across into the exact same directory, and this is a really important thing, if you’re going to move stuff around, then I suggest you copy the exact same page structure and directory structure. That makes it really easy to send a catchall redirect to the new site, because you can literally copy an entire site across to the new site, then you just do a redirection of the old site, and the corresponding page will go to the corresponding page. If you have /blue on the old domain, then it will go to /blue on the new domain. It makes it a lot easier for the usability. You don’t want to cause carnage and chaos for a website by chopping and changing all of your hard-won links and search engine positions. I’ve still got indexed pages from my old sites years later because of the 301 search engine friendly redirect. Now if you’ve got any comments on that point, I’ll ask you, Matthew, just before I go on to the next point that I wanted to make around this topic. Matthew: Yeah. I think the 301 redirects are big, both for SEO reasons and for you know, if you have old links floating out there as I did, when someone clicks on a link in the newsletter we sent out 6 months ago, we still want that link to go to the right place, and I think that’s hugely important if you’re switching websites. James: Yeah. And so my next point on this, which is similar, is you can then just go and modify your Send From addresses and your autoresponder systems, etc. I do have a little notice in my FastWebFormula community, and it just says, if you ever see FastWebFormula, that’s what this place used to be called. Because you’ve got to keep in mind that it’s only really going to affect people who knew you up until the point of the change. After the point of change, there’ll be so many new people that it’s not going to mean anything to them. So don’t overcook the warnings or the messages, keeping in mind once you’ve fully informed everyone who was there, then it’s like a new start. It really is like a fresh beginning. The interesting thing that I found, of all the brands I moved, and there was probably about 8, there’s one brand people keep talking about and keep mentioning, to the point where we’ve recently reestablished a site on that domain, because they still refer to SEOPartner. It’s the strangest thing. We haven’t had it for years. People still talk about our SEOPartner services. So we’ve done something similar to what you did with MarketBeat, is we’ve created a new source. We’ve created an industry news site and we simply put banners that redirect people to our products page. Our goal is to build up the industry news source for wholesale SEO resellers. So people who sell services but don’t provide the services or do them in-house, they should be getting the news from us and then they’ll be redirected to where they can buy wholesale services. So it’s pretty much the brand dictating that it’s so strong it deserves its own entity. Matthew: So why do you think that name got stuck in people’s minds when they just kind of forgot about other names? James: It’s such a good name because it says what it does. It’s both brandable and easy to understand. It’s got SEO in the words, so it’s very clearly delineated. It’s got PARTNER in the name, and that says, “Hey, we’ll do this with you.” Being a wholesale provider, it’s really easy for people to get it. Hey, these guys can partner with us, and we can go out and help customers. So because of the way that it went, and it wasn’t always like that, it wasn’t always positioned as a wholesale vendor, it just became the wholesale vendor. It went through this crazy phase. In the beginning, there was these two packages. Then we ended up expanding up to six or seven and then 10, and then we went back down to three or four, our core packages. And then we went more from retail to wholesale because of the side thing we’re talking about in the episode number 4, about growing your business around the same customer. Well, our coaching community customers are often resellers, and they always need products and services to resell. So it turned out that I’d created my own customer base for this wholesale vendor business. It’s a sticky, sticky name, and a great name. I originally bought that for $500 on GoDaddy auctions, and created that business live in a workshop called Business Internet Formula. It was my fourth workshop that I’d run. I created this business from scratch in the workshop live. We recorded it. The recordings are still inside the SuperFastBusiness membership. That business went on to become a 7-figure per year business in its own right, and it was born in this live case study. The domain was just a winner. It really is a good domain. So there you go. Sometimes, your customers will really drive the direction by showing you they just don’t get what you do or they totally get what you do. What sort of challenges are there with name changes? Did you find things that happened that you weren’t expecting? Thank you James and Matthew, this was very insightful. One thing I would like to ask is: what do you think a business should do with their social media profiles if the new name is taken? So let’s say that the domain is available to put their website on, but the username on Twitter, Facebook, etc. is taken so the name in the social profile url will not match the domain name. What should a business do in that case?